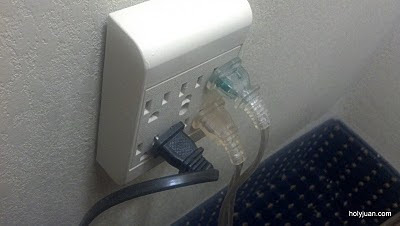 I don't know much about electricity, but this is what I found when I went to plug in my phone charger at the hotel. If you don't see it at first, look at the black plug. If you want to know the truth, this was the alarm clock and I didn't want to try and figure out how to set the clock, so I left it plugged in like this. Thank goodness someone else noticed! OP, stay off of reddit please. Or atleast stop submitting this garbage.